When we consider the concept of balance, we tend to think of it as a set destination, a singular attainable goal that is fixed in it’s position. We also associate balance with a sense of peace, calm and focus. Balance does in fact invoke a feeling of calm and centers the mind, essentially, bringing together all of the scattered pieces of our thoughts, feelings, emotions and energy. However, the true nature of balance is not fixed but is a journey; an ebb and flow. It truly can not be something that we continue to strive for in as in a goal, rather embrace the up and down, the left and right, and to also embrace it’s polar opposite; imbalance. When we say things like, “I lost my balance” or “I’m off balance”, we set ourselves up into believing that “balance” is something that we have in our possession. 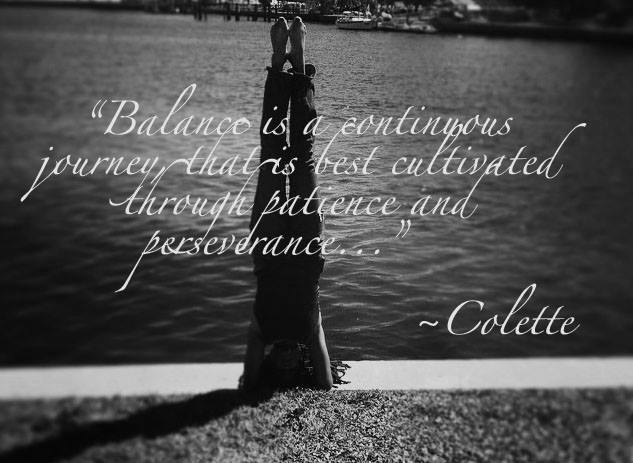 The art of balance rests, in it’s opposition, “imbalance”. And what is imbalance? Imbalance is the unfixed side of what we consider balance in general as being fixed in position. The art of balance is a dance. It is an evolution of energy, emotion, thoughts, actions, words, deeds, and so on. It is the cultivation of these things to promote a collectively harmonious rhythm of life, through the means of patience and perseverance! The art of balance is to also accept falling. Like wise, there is an art to falling. Falling and balancing are just currents of energy, an up and down, left and right, centered and not centered, and ebb and flow nature. There can be a gracefulness to falling. It is simply a matter of accepting that falling is another counter part of balance itself. That with falling, comes the understanding of how to pull together our energy, stream line it and focus it so as to experience a sense of balance. Upon your next yoga class and you find yourself in warrior 3 pose or handstand, consider these aspects, and allow yourself to “feel” all that comes with the ceaseless flowing nature of balance itself. You will begin to feel the sensation of peace, calm and focus, you also feel the erratic, chaotic, and fragmented portions of yourself as well. Allow all of it to become a collective harmonious rhythm in your yoga practice!